Since hard drives have been used with Macs, starting in 1986, they have been both a blessing and a curse. On the blessing side, they can hold vast amounts of information. In 1986, $5,000 could buy a 5-megabyte hard drive, far faster and far more convenient than the equivalent seven floppy disks. Today, $110 will buy you a million megabyte drive, capable of storing more information than a houseful of floppy disks. But as Spiderman learned, with great power comes great responsibility. Yes, you can store staggering amounts of information, and retrieve it very quickly, too. And you can also lose staggering amounts of information. This potential loss is behind Apple’s inclusion of Time Machine with Mac OS X 10.5 Leopard. Time Machine takes about 95% of the effort and pain out of backup. Any unusual slowdown or aberrant behavior on the part of the Mac. You should also check the drive after the installation of any operating system updates, and periodically just for the heck of it -- at least once a month. In a perfect world, you’d see the message “Volume passed verification” every time you pressed the Verify Disk button in Disk Utility. But sometimes Disk Utility reports are not quite so rosy. Some of the less rosy reports predict future disaster. 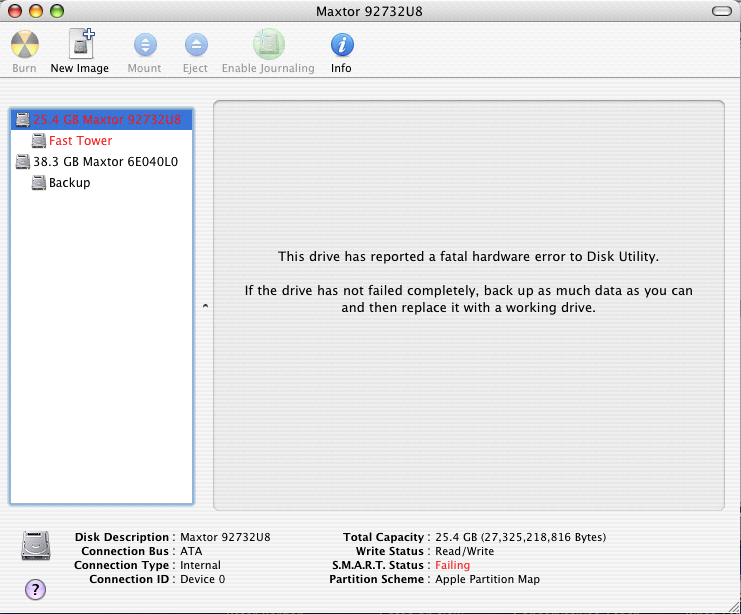 Disk Utility reports that the top, highlighted, drive has failed, and needs to be replaced. Heed the message in the center of the screen. Note the S.M.A.R.T Status message in the bottom panel. S.M.A.R.T. (Self-Monitoring, Analysis and Reporting Technology) is splendid when it works, and when the user notices. But so few users ever bother to routinely check their drives that S.M.A.R.T. messages are rarely seen. Even after seeing a S.M.A.R.T. failure notice, some users tend to rant and rave about unfairness, or ignore the warning and continue to use their computer. The proper response: do exactly as directed in the on-screen notice. Backup what you can; the end is at hand. Fortunately, such messages are extremely rare. Unfortunately, the message in Figure 3, or some equivalent, is not. 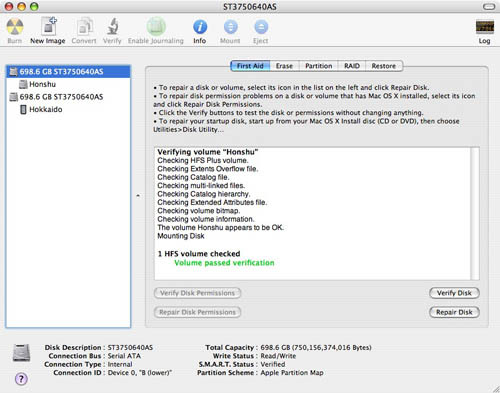 During a Disk Verify, Disk Utility reported there was an “Invalid sibling link” and “Volume check failed.” A subsequent attempt to repair the damage, triggered by pressing the Repair Disk button, also failed. This sounds bad. During a routine Disk Utility check, using the Verify Disk function, an invalid catalog entry was found. 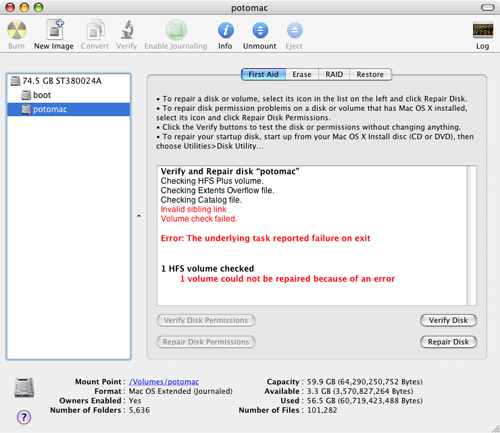 Pressing Repair Disk could not fix the problem. The next step: back up everything and reformat the drive. And it is bad. But unlike the previous example, recovery is usually possible. If the volume hasn’t been backed up yet, back it up. 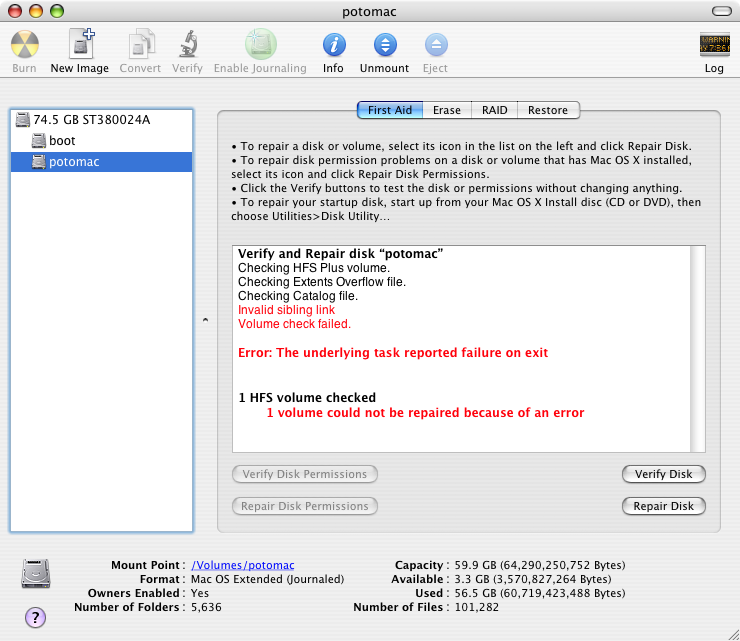 Then format the drive and, in the vast majority of cases, the problem will be solved. An “invalid sibling” is not some character out of a Shakespearean play but, rather, an accounting error. Disk drives maintain a catalog of where data is stored and, for whatever reason, a portion of the catalog is invalid. Reformatting the drive wipes out the catalog (and, of course your data), allowing the drive to begin again with a blank slate. There is one commercial utility, Disk Warrior, which can often repair a damaged disk catalog without a reformat. We won’t address that here since the intent is to praise Disk Utility and encourage you to use it, regularly. 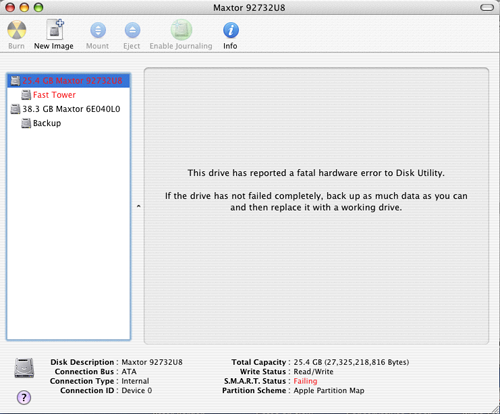 There is also the somewhat delicate issue of Disk Warrior’s limitations: it doesn’t check your disk regularly (you have to do that, with Disk Utility), it doesn’t back up your disk (you have to do that, with Time Machine), and most important, it isn’t a magic elixir. It is a one-trick pony: it can, fairly often, repair a damaged disk catalog. And that is all; after it is done, you’ll still need to use Disk Utility to Verify Disk. Disk Utility can also do far more. It can successfully repair most catalog errors. It can copy CD-ROMs and DVD discs. It can make disk images of CD-ROMs, DVDs, and even hard drives. It can create software RAID volumes. It can completely clone one hard drive to another. But most important of all, it can Verify Disk. Do so. Regularly. Remember: with great power comes great responsibility.